Dan, it’s always good to hear from someone who finds my information useful. Do you have a problem with voles eating your root veggies? Voles ate my parsnips, which I left in the ground for the winter. I agree, Cindy, fall and winter carrots are the best! My problem is finding the space to plant them early enough. I planted some at the end of July, some in mid-August, and some September 2. The earlier ones did better. I’ve still got a bunch in a cold frame that are just holding. It’s fun to pull them in January. I love your idea of making rye rows and planting the carrot seed in the stubble. I will definitely try to work that into my rotation. I followed your advice and planted carrots yesterday in my 4′ wide bed. I planted 7 rows lengthwise. How many do you plant? I’m just trying to figure out the spacing because I’ve looked at several sources and all have different numbers. Thanks! I put 7 rows in my 4′ wide bed. With all the rain we’re having, they should be up in no time. 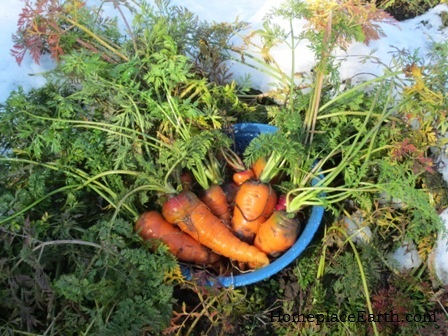 Just watch for weeds at first, then you will be on your way to winter carrots. Yeah! This post is exactly what I was looking for, thanks. I really like the idea of the rye for an alternate crop. Two questions: 1) Do you need to rotate beds for any reason? 2) Your statement, “Just watch for weeds at first…” is a huge understatement for me. I have a terrible time growing carrots due to weedsweedsweeds and even more problems with parsnips as they seem to take longer to germinate. Does the rye help keep the weeds back? Does anything? All the crops get rotated from one bed to the next in my rotation. Everything will have something preceding it. I’ve found that the timing for rye fits well with winter carrots. The trick to not having weeds is not letting weed plants go to seed. 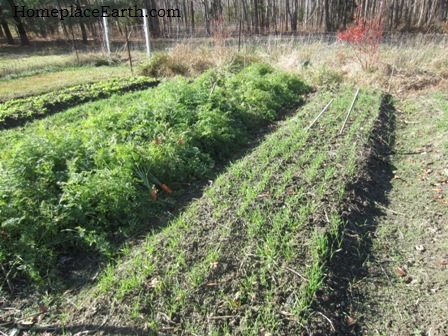 If you leave things go in the fall and don’t plant a cover crop for winter, it is likely that some weeds will have gone to seed, naturally planting themselves for the next year. If you know you have excessive weed pressure, maybe you could cut the rye and let the first weeds germinate. Take them out and plant carrots. I’m curious as to why you buy in carrot seeds rather than save them. Saving them closes the production/consumption circle. Mike, you’re right about saving your own seeds closing the circle. I save a lot of my own seeds. You have to be on the ball to save carrot seeds, since they produce seed the second year. Growing them through the winter is the first step, so I’m halfway there. Something often comes up to take my attention from nursing my carrots to the seed stage. This year it was a cold wet spring and throwing all my attention to completing my upcoming book. Buying the seeds I need from sources close to home connects me to my local/regional community, which also needs to be tended to so that it can be resilient as we go forward into changing times. Yep, all the biennials like carrots, parsnips, turnip, beets involve a bit of finesse. I agree with your comments about connecting with seed sources close to home but I think that saving your own trumps that in one critical aspect. As with any skill, you have to learn the tricks. In our zone, we can’t leave our root vegetables in the grown because it freezes like a rock. Deep mulching is a non-starter unless we want to wade through snow and even then there are no guarantees that the mulch hasn’t become home to critters who will dine on the sweet vegetable treats. So we root cellar them in Rubbermaid tubs filled with children’s play sand. We have one tub that is solely for seed so that we don’t inadvertently eat next year’s seed. The experience gained is invaluable. Carrots cross with Queen Anne’s Lace which is all around us. At first we bagged the carrot flower heads but then we decided not to in order to see just how much crossing occurred and what it was like. Is it possible to identify the crosses and rogue them out? We don’t know yet because we haven’t dug our carrots yet this year. If we find a lot of crosses, we will have to increase the space that we allocate to carrots. Since we grow intensively in raised beds that may not be a problem but it will be a factor in our overall space allocation. This year our seed beets did not bolt and flower so we have no seed from them but we do have seed left from last year. We always keep seed in reserve so we’ll get to see how viable two year old beet seed is. Another reason for saving biennial root vegetable seed as well as other vegetable seeds is that they start to adapt to your soil and micro-climate conditions. We always leave a couple of plants in the ground just to see if they will overwinter. So far only the parsnips have and we continue to harvest seed from them. We’re selecting for in ground storage.